The Parrot does not satisfy himself with cockle-burs, but eats or destroys almost every kind of fruit indiscriminately, and on this account is always an unwelcome visiter to the planter, the farmer, or the gardener. The stacks of grain put up in the field are resorted to by flocks of these birds, which frequently cover them so entirely, that they present to the eye the same effect as if a brilliantly coloured carpet had been thrown over them. They cling around the whole stack, pull out the straws, and destroy twice as much of the grain as would suffice to satisfy their hunger. They assail the pear and apple-trees, when the fruit is yet very small and far from being ripe, and this merely for the sake of the seeds. As on the stalks of corn, they alight on the apple-trees of our orchards, or the pear-trees in the gardens, in great numbers; and, as if through mere mischief, pluck off the fruits, open them up to the core, and, disappointed at the sight of the seeds, which are yet soft and of a milky consistence, drop the apple or pear, and pluck another, passing from branch to branch, until the trees which were before so promising, are left completely stripped, like the ship water-logged and abandoned by its crew, floating on the yet agitated waves, after the tempest has ceased. They visit the mulberries, pecan-nuts, grapes, and even the seeds of the dog-wood, before they are ripe, and on all commit similar depredations. The maize alone never attracts their notice. On the ground these birds walk slowly and awkwardly, as if their tail incommoded them. They do not even attempt to run off when approached by the sportsman, should he come upon them unawares; but when he is seen at a distance, they lose no time in trying to hide, or in scrambling up the trunk of the nearest tree, in doing which they are greatly aided by their bill. Their roosting-place is in hollow trees, and the holes excavated by the larger species of Woodpeckers, as far as these can be filled by them. 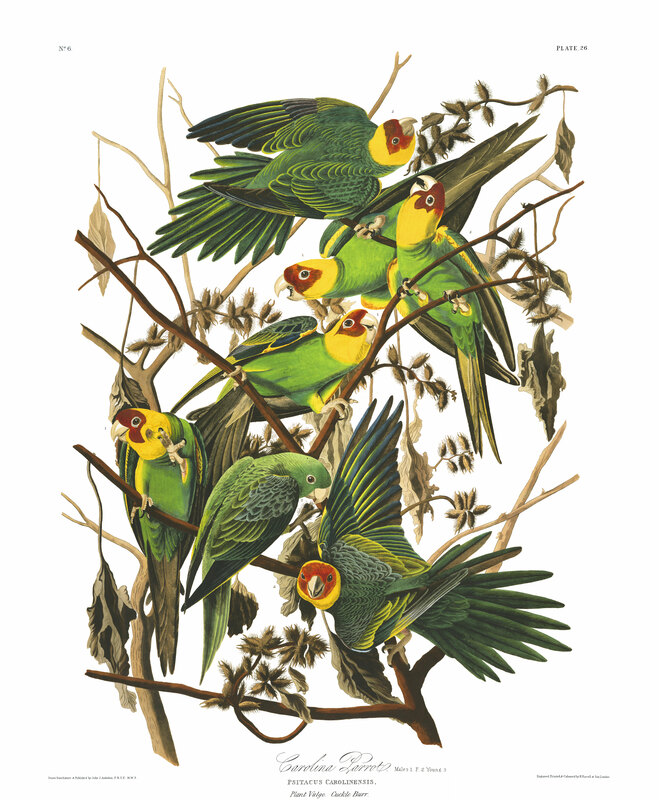 At dusk, a flock of Parakeets may be seen alighting against the trunk of a large sycamore or any other tree, when a considerable excavation exists within it. Immediately below the entrance the birds all cling to the bark, and crawl into the hole to pass the night. When such a hole does not prove sufficient to hold the whole flock, those around the entrance hook themselves on by their claws, and the tip of the upper mandible, and look as if hanging by the bill. I have frequently seen them in such positions by means of a glass, and am satisfied that the bill is not the only support used in such cases. When wounded and laid hold of, the Parakeet opens its bill, turns its head to seize and bite, and, if it succeed, is capable of inflicting a severe wound. It is easily tamed by being frequently immersed in water, and eats as soon as it is placed in confinement. Nature seems to have implanted in these birds a propensity to destroy, in consequence of which they cut to atoms pieces of wood, books, and, in short, every thing that comes in their way. They are incapable of articulating words, however much care and attention may be bestowed upon their education; and their screams are so disagreeable as to render them at best very indifferent companions. The woods are the habitation best fitted for them, and there the richness of their plumage, their beautiful mode of flight, and even their screams, afford welcome intimation that our darkest forests and most sequestered swamps are not destitute of charms. They are fond of sand in a surprising degree, and on that account are frequently seen to alight in flocks along the gravelly banks about the creeks and rivers, or in the ravines of old fields in the plantations, when they scratch with bill and claws, flutter and roll themselves in the sand, and pick up and swallow a certain quantity of it. For the same purpose, they also enter the holes dug by our Kingfisher. They are fond of saline earth, for which they visit the different licks interspersed in our woods. Bill short, bulging, very strong and hard, deeper than broad, convex above and below, with a cere at the base; upper mandible curved from the base, convex on the sides, the margin overlapping, with an angular process, the tip trigonal, acute, declinate, much exceeding the under mandible, which is very short, broadly convex on the back, truncate at the extremity. Nostrils basal, round, open, placed in the cere. Head very large. Neck robust. Body rather elongated. Feet short and robust; tarsus scaly all round; toes scutellate above, flat beneath, two behind and two before, the latter united at the base; claws curved, acute. Plumage compact and imbricated on the back, blended on the head, neck, and under parts. Orbital space bare. Wings long, second and third quills longest Tail long, wedge-shaped, of twelve, narrow, tapering feathers. Bill white. Iris hazel. Bare orbital space whitish. Feet pale flesh-colour, claws dusky. Fore part of the head and the cheeks bright scarlet, that colour extending over and behind the eye, the rest of the head and the neck pure bright yellow; the edge of the wing bright yellow, spotted with orange. The general colour of the other parts is emerald-green, with light blue reflections, lighter beneath. Primary coverts deep bluish-green; secondary coverts greenish-yellow. Quills bluish-green on the outer web, brownish-red on the inner, the primaries bright yellow at the base of the outer web. Two middle tail-feathers deep green, the rest of the same colour externally, their inner webs brownish-red. Tibial feathers yellow, the lowest deep orange. Length 14 inches, extent of wings 22; bill along the ridge 1 1/12, gap, measured from the tip of the lower mandible, 1/2; tarsus 5/6 middle toe 1 1/4. XANTHIUM STRUMARIUM, Willd., Sp. Pl., vol. iv. p. 373. Pursh, Flor. Amer., vol. ii. p. 581. Smith, Engl. Fl., vol. iv. p. 136.--MONOECIA PENTANDRIA, Linn.--CORYMBIFERAE, Juss.